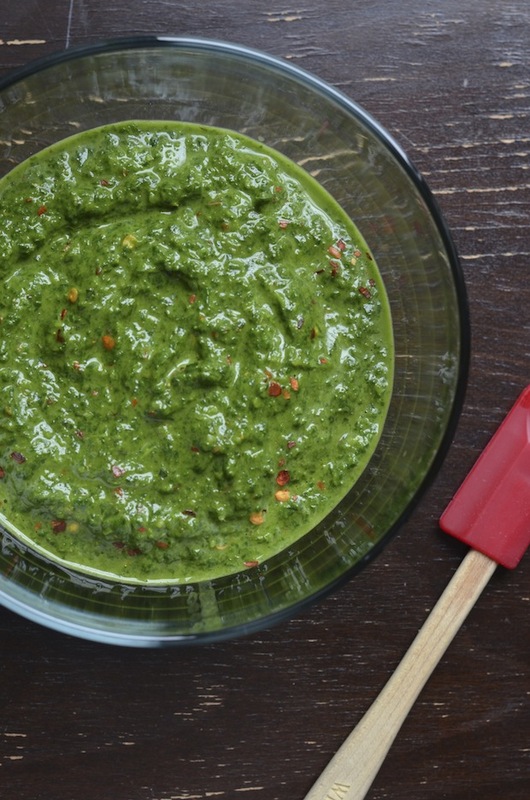 Chimichurri--the savory, spicy herb sauce from Argentina--is one of my absolute favorite condiments. Typically served with churrasco or other grilled steaks, it's also fantastic used in other dishes as a spread or sauce. In this pasta salad recipe, easy homemade chimichurri takes the place of pesto for a light dish that's perfect on its own or as a side with your favorite protein. The trick to make this dish sensational is to make the chimichurri from scratch--a super simple process (you really just need a blender or a food processor and about 2 minutes!) that really makes all the difference as it allows you to control the ingredients and adjust the seasoning so that it is perfect for your family. Do they love spice? Feel free to pump up the red pepper flakes. Or play around with the herbs you know your family loves. While traditional chimichurri is made with just parsley, I like to add cilantro to brighten up the dish. If you're not a fan, you can just skip it and use all parsley (or replace it with another favorite herb like basil or mint!). 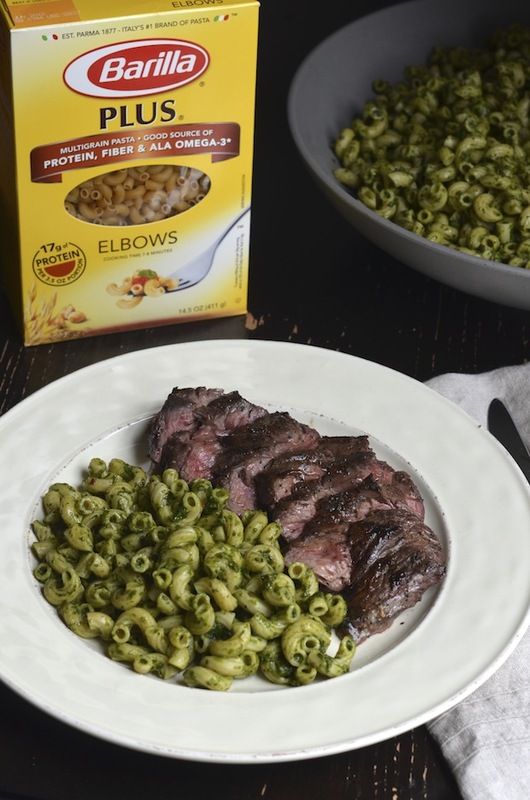 I love using Barilla® Plus® multigrain Elbows for this dish. They're 44% higher in protein, have almost twice (!) as much fiber than traditional pasta, and--due to the small shape--create the perfect balance between sauce and pasta in every mouthful. It's a natural choice for a pasta salad, and a great way to introduce your family to more nutritious whole grain pasta. 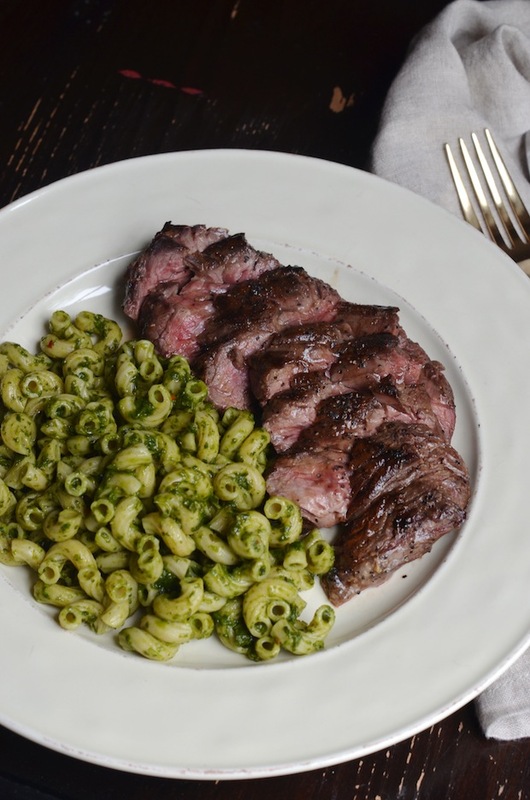 I served my pasta salad as a side with grilled steak, the way I would typically serve rice. The chimichurri flavors worked perfectly with the steak, and the savory pasta was a welcome change to the usual rice and beans. You can also dice up grilled chicken or cooked shrimp and toss with the pasta to make it a complete meal all on its own. Have you ever served pasta as a side dish with your dinner? What other kinds of protein would you pair with this dish--let me know in the comments below!